Ringed by mountains and situated in an ancient volcano crater, Kurilskoye Lake is one of Kamchatka's trademark destinations. 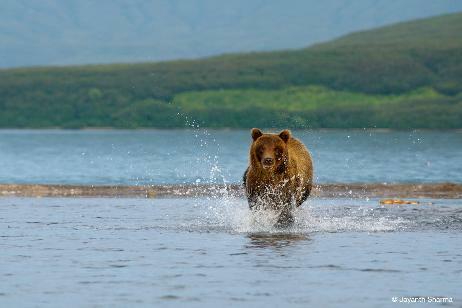 Stay in a quaint, wooden lodge on the lake's shores and take part in some of the best bear viewing on the peninsula. Watch the massive pink salmon run and take walking excursions on the lake to view Stellar sea eagle's nesting. After Kurilskoye Lake you'll visit some of Kamchatka's active volcanoes. At the end you will take spectacular helicopter flight north of peninsula visit the famous Valley of Geysers and caldera Uzon volcano. Day 1. Arrival in Petropavlovsk-Kamchatsky. Transfer from the airport to a hotel. Prepare for the trip, buying rubber boots and mosquito repellent for the Lake, if needed. Welcome dinner in a restaurant. Day 2. Flight by MI-8 helicopter to Ksudach Volcano (1hr). If weather permits (if bad weather, we will try to landing in Ksudach on Day 5th), we will make an excursion to the crater lake of Schtubelya (situated inside Ksudach Volcano) and visit a lovely waterfall (from air) where water cascades out of the crater. 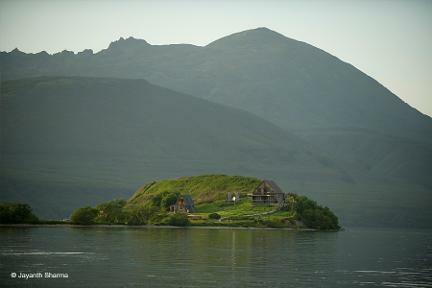 Or visit hot springs that create a "hot beach" on the lake's shore. Short flight to Kamchatka's famed Kurilskoye Lake. Accommodation in a small cozy wooden lodge on Grassy Point. The lodge is two stories with 2 bunk rooms of 8 people each on the second floor. A dining room and shower/WC are situated on the first floor. A "wrap around" deck affords a gorgeous view of Kurilskoye Lake and surrounding mountains. 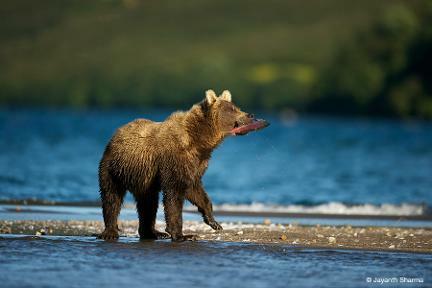 Often it is possible to watch bears fishing along the lakeshore without even leaving the territory of the lodge. Make an excursions along the lake's pumice rock beach. In-camp instruction. Electricity and hot shower available in lodge from 7PM till 11PM daily. Days 3-4. 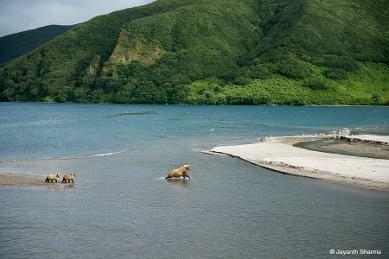 View Kamchatka brown bears, Stellar sea eagles, salmon spawning places. Take motor boat excursion and walking excursions with local wardens to a nearby bear view platform (250 meters from the lodge) that is located at the mouth of the many rivers that drain into Kurilskoye Lake. Here you'll have a good chance of taking great, close-up shots of bears fishing for migrating salmon. 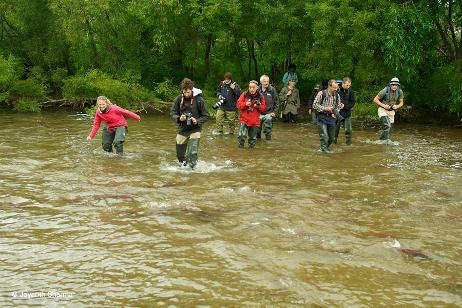 The salmon pause briefly in the lake and then make their way from the lake into the streams where they spawn. Take longer walking excursions to a large meadow where bears feed on wild berries and visit other spawning streams farther from the lodge. Along these streams you'll see spawning salmon and many signs of the large number of bears in the area. 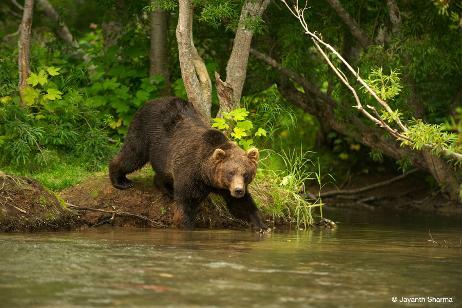 There's a good chance you'll see bears fishing just a few yards away as you walk along the banks of streams. 50 meters to the bear. Day 5. Take walking excursions with local wardens to a nearby bear view platform (250 meters from the lodge). Evening helicopter MI-8 flight to stop for a bathe in the thermal hot water of the Khodutka River. 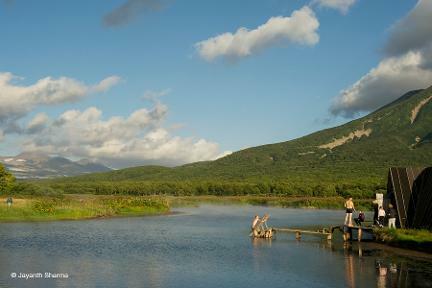 This is the largest wild hot springs on Kamchatka. The water bubbles out on a section of tundra located just under Khodutka Volcano and forms a small stream. Farther from the source the water slowly cools and you can find the location where the temperature is right for you to take a swim. Helicopter lands near tent camp on Mutnovsky Volcano plateau, where our 4 or 6WD truck and Russian team will wait for you. Accommodate in tent camp. Day 6. Breakfast. Have an anorak, extra sweater and woolly hat on, or in a day bag. Food is not needed. A water bottle is useful for your own drinking supply. Leave everything else in your tent. Mutnovsky volcano. The volcano walk is on a single trail there and back, and everyone should walk into the caldera. Wandering off alone is seriously discouraged, as snow bridges, ice falls and unstable ground on geothermal crusts all provide hazardous environments. From the Osvystannye campsite, the walk is nearly 7 km, with a rise of less than 600 m, into the main caldera. A gentle stroll soon starts to climb steadily on the bedded pyroclastics of the Mutnovsky slopes beside a stream which emerges from the caldera exit gorge ahead. From the Dachnye campsite, the walk is longer but with less to climb. A 6WD bus goes as far as possible on a track below the two hills of Skalisty and Dvugorby , which are volcanoes more than 20,000 years old of pale rhyolite lavas and pyroclastics. Beyond the track, a foot-trail climbs past more old bore holes spouting steam, to the pass between Mutnovsky and Dvugorby, from where Asacha (left), Opala and Gorely (right) are seen ahead. The route then makes a long traverse of the hillside, on a mix of rough tundra, blocky andesite lava and banks of airfall ash and pumice reworked by the wind; it crosses three broad snow-fields, before a final rise to the mouth of the caldera exit gorge. The two routes meet above a short descent into the gorge. Above the steep wall to the south, the steam plume can be seen rising above the active crater of the volcano. Seen away to the east, there are cinder cones and tuff rings over flank vents on the Gorely slopes. FeedingThe Mutnovsky 3 caldera The walk up the gorge is largely on banks of hard snow and firn ice, that has accumulated in winter avalanches off the gorge walls. Much of the surface is covered in wind-blown ash, and some of it is melted into little astrugi pinnacles; the caldera drainage flows in snow caves on the rock surface, and is sometimes seen or heard deep in crevasses or collapse areas. The gorge walls are cut in coarse rhyolitic pyroclastic flows laced with thin dark dykes. The caldera's eastern glacier lies ahead where it melts out on a steep rock slope, aided by a series of fumaroles; steam from these has created ice tunnels that emerge in the glacier snout. Climb the slopes of volcanic tephra and glacial till on the right, and descend slightly to the snout of the western glacier, which is also advancing over fumaroles. A way between the ice and the caldera wall passes beside various geothermal vents; these include fumaroles, mud pools and solfataras, and their style may change within hours as melt-water from the adjacent glacier seeps into the ground and is boiled at very shallow depth. A lake is sometimes dammed up behind the glacier; at other times it drains through the ice, leaving a flat bed of reworked ash pitted by solfataras and boiling mud-pools. Streams emerge from the snow and ice fields, and flow back under the glacier toe. Picnic lunch is taken at some spot away from the fumaroles that are active at the time of the visit The caldera floor is at an altitude of about 1540 m, which is still 800 m below the ice-capped summit of the Mutnovsky volcano. The walk continues up the western snow-fields below the caldera wall cut in thinly bedded pyroclastic flows that are probably old surge deposits. The glacier on the left has its source in the stage 4 caldera, which has coalesced with the main caldera that is largely of stage 3. A steep scramble aided by rope handlines leads up coarse welded pyroclastics to a knife-edge ridge between the caldera and the active crater. The steam plume from the active crater rises far above, but when the wind blows it around, the vigorous fumaroles and solfataras that are its source can be seen on the crater floor. The crater is about 350 m across, and its walls drop nearly vertically for over 100 m to its flat floor of scree and inwashed ash. Return to the campsite back along the outward route. Dinner at camp. Accommodate in tent camp. Day 7. Karymsky Volcano. Breakfast. Pack your overnight bag and sleeping bag, and roll up your camp-mat, and put them all in the vehicle before setting out for the day's walk. Have an anorak, extra sweater and woolly hat on, or in a day bag. Food is not needed. A water bottle is useful for your own drinking supply. Gorely volcano Again the volcano walk is on a single trail there and back, where members can walk as far as they wish and then return down the same trail. Avoid walking alone; in case of accidents as trivial as a sprained ankle, it is best to be in groups of at least three. From either campsite, the 6WD bus head north to the track round the edge of the large lake that lies in the unfilled eastern crescent of the Gorely caldera. From the lake flats, the walk up the volcano is about 5 km, climbing steadily to gain 750 m in height. The walk up the huge shield volcano is over a mixture of rough grassy tundra with very low dwarf willow and bare stripes of basaltic a lava. Some lava flow structures are recognizable, and there are also patches of volcanic ash redistributed by the wind. Aim up the slope for the saddle between the two low summits which are the raised rims of separate craters. Higher up, long gently graded snow-fields provide the easiest route up (and certainly the best way to come back down). The southwest crater, to the left, is dead and rather featureless. Head through the saddle and then round to the right, along the far rim of the main crater complex. The first large crater contains a cold lake about 100 m below; its surface has ice floes from a small glacier on its internal slope. The walls of all the craters expose profiles through thick sequences of lava flows with a limited component of interbedded pyroclastics. Continue beyond it to a broad shelf that extends inside the very large old central crater. Picnic lunch on the shelf. Just ahead, there is a sudden, unguarded, vertical descent into the active crater. Over 100 m down, a hot acidic lake has active fumaroles and solfataras around its margin and beneath the surface. The recent eruptions of Gorely have been largely steam events produced when these vents heat up and therefore increase their output. Return back along the outward route to the bus by the lake. The bus head back out of the Gorely caldera, and then return to a hotel in the Paratunka Valley. Rest and swim in pool with thermal hot water. Day 8. NOTE: this day can be swap with Day 9. Breakfast in hotel. Leave in a conventional bus, for the journey back to Petropavlovsk. Bring all your baggage with you. Puffin Boat excursion in Avacha Bay. 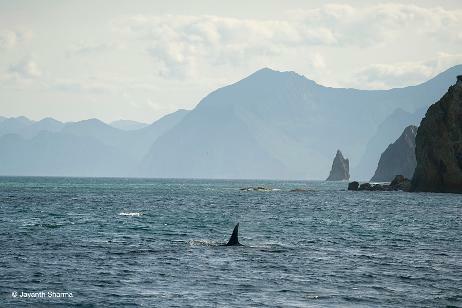 A boat trip (6 hours) out into the bay is a very relaxing way of gaining an alternative view of the splendid setting of Petropavlovsk and its dramatic volcanoes. Departing from a pier near the center of town, the expanse of the hilly city soon falls into perspective. Further toward the middle of the bay, both Koryaksky and Avacha volcanoes come into view behind the city. When Avacha erupted in 1991, people living in Petropavlovsk could watch the red stream of lava coming down the slope towards the city, while hot ashes were shooting into the skies above the summit crater. Avacha Bay is geographically as perfect a bay as a city could hope for. It is large and deep, with a narrow opening which keeps out foul weather and ice. The harbor is open to shipping year round, and is also well protected from the dreaded tsunami waves that are created by earthquakes around the Pacific Ocean margins. The boat heads toward the mouth of the bay, allowing views of the Northwest side of Petropavlovsk and the many boats that make their home in these ports. Near the mouth of the bay, the Three Brothers are tall finger-like sea stacks, whose rock faces rise vertically out of the water. The cliffs around the bay house many colonies of seabirds in their natural habitats, and puffins are commonly seen among many other types of seabird. Hot lunch is aboard. Geology Museum There is opportunity to see the small museum, with its spectacular photographs of most of the volcanoes. Specimens are labeled in Russian, so provide a fun identification challenge; don't miss the huge mass of black sulphur (looking like dull basalt glass) that came from Bannoe Lake at Uzon. Return to the Petropavlovsk Hotel some time in the afternoon, and take your own walk in Petropavlovsk. Dinner is in the hotel. Geysers Valley. Day 9. 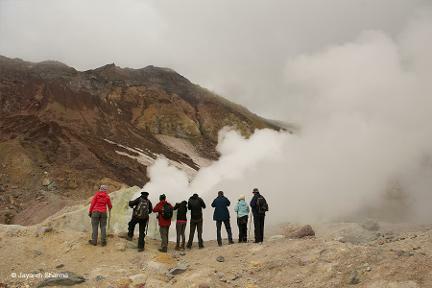 Optional helicopter excursion to the Geysers Valley and caldera Uzon volcano. Breakfast in hotel. Leave your things in your room, as we return in the evening. Wear boots and outdoor gear. Have rain gear and a spare sweater in a day bag; no food is needed; keep clutter to a minimum as it will only be a pain in the helicopters. Leave in our own conventional bus, for the 45 minutes drive to the heliport, at Yelisovo, close to the main airport. The helicopter flight to the Valley of Geysers takes about 75 minutes, on either of two routes. The all-weather eastern route heads round the southern and eastern flanks of Avacha, flying at heights of just a few hundred meters above ground if that is necessary to keep below any thick cloud cover. It continues north up a broad valley to the east of the Zhupanovsky volcano; the low flying gives splendid views of the taiga landscape, and this valley is home to many brown bears, who may be easily seen from above. Over a low col, the flight approaches the coast, where a few hunters' cabins lie among the trees; Karymsky and the two Semlyachik volcanoes lie inland to the left. The flight then turns inland up the valley just before the Kikhpinych volcano, and turns into the lush green tributary which is the Valley of Geysers. The western route heads round the western side of the smaller cones of Arik and Aag, which continue the line of volcanoes northwest from Koryaksky. It then heads across the interior tundra, keeping west of Zhupanovsky, on its way to Karymsky If the eruptions are still in Strombolian style, one should be seen on the flight past. The active cone is 700 m high, and stands inside an old caldera; the even older Dvor caldera is truncated as the higher bowl to the north. Just to the south, Karymsky Lake lies in the Academia Nauk caldera, which erupts less frequently. Northwards, the flight goes over Maly Semlyachik volcano with its spectacular crater lake of green water. Past the inactive Bolshoi Semlyachik, the route veers slightly right for the Valley of Geysers. The Valley of Geysers The cluster of geysers, fumaroles and hot springs in this valley were only discovered in 1941. They lie above the marginal fractures of the oldest Uzon caldera. The hot water that emerges is largely recirculated rainfall, mixed with some juvenile water from magma. The magmatic heat source is probably the roots of the Uzon volcano, where ground temperatures reach 250°C at about 500 m depth beneath the caldera floor; alternatively, the Kikhpinych volcano may be the heat source. The Geysernaya River has cut its valley into bedded andesitic tuffs that were deposited in a lake in the first Uzon caldera; the southeastern valley slope is the heavily eroded caldera wall, broken into older volcanic. Some dacite lavas and intrusions occur in the tuffs, and all the exposed rocks have been altered hydrothermally. Some slopes have been gullied to leave earth pillars. There are extensive deposits of opaline siliceous geyserite, some built into large banks and terraces below the main vents. The valley's geysers include a few with large but brief periodic eruptions, and many more which produce hot water spouts frequently or almost continuously. Uzon calderaThe helicopters land in front of the timber lodge that is the access point for all visitors to the trails into The Valley of Geysers (Dolina Geyserov), within the Kronotsky Nature Reserve. Walkabouts in the valley are not allowed, so we will stay in a group. The boardwalk leads to the lip of the valley for a fine overall view. The upper slopes of the valley expose cliffs of pumaceous tuffs, some eroded into earth pillars. The valley floor has a lush green plant cover, except where active banks of geyserite have not yet been colonized. A branch to the left ends at the Bolshoi (Big) and Maly (Small) Geysers. An eruption of Bolshoi, on the left, throws water about 10 m high amid clouds of steam, for about 10 minutes; it erupts on a cycle of about 75 minute. Maly Geyser throws water out at 45° for about 8 m, in eruptions lasting 5 minutes on a 35 minute cycle. The main path descends to a bridge over the Geysernaya River a little further upstream. The river reaches a temperature of 26°C with its geothermal input in the summer; winter snow-melt reduces it to about 16°C. Water from the springs and geysers varies from 35°C to 100°C. Just upstream of the bridge, the Schell (Crack) Geyser erupts briefly every 35 minutes; it was heavily eroded during a typhoon flood in 1981. The Fountain Platform is a great bank of geyserite producing copious quantities of steam from numerous vents; it is claimed as the world's greatest concentration of geysers and fumaroles. On the platform. Malachite Grotto is a nearly permanent spouter erupting from a geyserite cone; the Fountain and New Fountain are connected so that they switch their water spouts every few minutes but combine to provide almost continuous activity. The boardwalk ends before another old bridge. Velikan (Giant) Geyser is on the far bank, inside the bend of the river; it erupts with a cascade of water to heights of about 25 m, but only for about a minute, before sending steam jets to far greater heights for another few minutes; its cycle is around 8 hours. A trail on the terrace above the valley floor provides views down onto the Fountain Platform, and also passes various hot pools, blue with suspended clay, and boiling mud pots, red with iron oxides. Lunch is scheduled at the Valley of Geysers lodge. The Uzon Caldera The Uzon depression is bordered to the north and west by steep caldera walls that have survived into the modern landscape. These are essentially features of the second in the series of three caldera collapses; the third (minor) collapse merely deepened the depression west of the heli pad that is now largely marsh ground and lake remnants on a floor of lacustrine sediments. The highest ground is formed by the basaltic cone of Uzon volcano, which stands above the western rim of the caldera. Immediately west of the heli pad, Bannoe Lake has a steam vent beneath it; this erupted in 1989, but is now quiet. The lake is about 30m deep, and its bottom 7m are a pool of liquid sulphur at a temperature of 140oC; large blocks of glassy black sulphur have been extracted by volcanologists. It appears that the sulphur vent is similar to the black smokers of ocean floors. Further west, trails wind across the marsh ground on the caldera floor to a variety of hot springs, boiling lakes and mud pots in the dacitic tuffs and lake sediments. Various of the hot springs have associated sulphur, opal, pyrite and mercury deposits. Most of the colouring at the spring sites is due to temperature-sensitive algae. Towards the east, a trail leads through alder bushes up the Belaya dome; this is formed of slab-jointed dacite porphyry that varies from dark lava and tuff to glassy obsidian and light pumice. Some is hydrothermally altered, with kaolinite, opal, alunite and sulphur. Adjacent to Belaya, there are two small acid lakes with pH of 2. Further north. Lake Dalneye is nearly 1 km across, in a splendid maar crater fringed by a tuff ring of very scoriaceous basalt; it was produced by the modest steam explosions of a phreatic eruption from a vent beneath the lakes and marshes of the caldera floor. Return by helicopter to Yelisovo, and by bus to the Petropavlovsk Hotel. Dinner in hotel.